Update: Georgia Power has elaborated on the problem and explained that it was equipment failure at Delta that caused the outage. Additionally, Delta has expanded their travel waiver to cover Tuesday travelers as well as those affected on Monday, though travel still needs to take place by Friday. Finally, a correction regarding the American Express Platinum protection – this protection is an added purchase, while it is complimentary with the Citi Prestige and Chase Sapphire Preferred. Update 2: Delta is extending their waiver another day as there were more cancellations today, and more are expected for tomorrow. As many of you are aware by now, a power outage in Atlanta resulted in Delta going dark this morning. Starting at 2:38 AM, the outage lasted for 6 hours and affected everything from displays at airports to mobile apps and the check-in kiosks. Thankfully they are issuing free travel change waivers for those affected today. René, of RenesPoints on BoardingArea, has a helpful post outlining how to handle a situation like this. The most important things to do are to remain calm and polite when working with customer service representatives. They’ve been dealing with this problem since customers started to get affected by it this morning, and they likely won’t be done cleaning things up for a few days. Make use of the travel change waiver, if your plans are somewhat flexible, and read up on your credit card’s travel interruption protection coverage! Some cards, like the Chase Sapphire Preferred, American Express Platinum, and Citi Prestige, will cover purchases for food, hotel stays, and other essentials for delays exceeding certain periods. With the Citi Prestige, for example, any delay over 3 hours qualifies. The Chase Sapphire Preferred [affiliate link] requires a longer period: 12 hours. The Platinum card from American Express [affiliate link] is in the middle at 4 hours. Links to the documentation for these cards can be found below, and a full list of cards that cover such expenses can be found at MileCards. Remember – stay safe and don’t panic if your flight is cancelled; Delta will make sure you get to your destination! It never hurts to send them a tweet (@Delta), but again remember that there is a person behind that screen, and they’re doing whatever they can to help everyone affected. As we continue into the holiday season and temperatures drop (in most US cities), there are many things to keep in mind. Wintery weather brings with it delays, cancellations, and colds. Though it’s impossible to plan for every contingency, proper planning will help mitigate a great deal of travel woes. It’s not possible to accurately predict weather all the time, but with the technology (and crowd-sourcing) available, we can get pretty close! Keep an eye on not just your point of departure and destination, but also the projected flight path (more on that below). Pilots will do their best to avoid the nastiest chop, but sometimes there’s nothing to be done but to fly through. If motion sickness is a concern, be sure to keep some Dramamine [affiliate link] handy! In addition to weather, there are quite a few reasons that your flight might be delayed or cancelled – anywhere from your inbound flight being delayed to equipment issues or the flight crew missing connections. Fortunately, you can keep an eye on some of that using the tools I mention below. If you aren’t familiar with it, FlightAware is a wonderful resource for fliers. Regardless of how often you fly, it is worth keeping on your phone for handy access. It allows you to track your flights, including their inbound flights, and projected flight paths. It even overlays weather patterns to give you an idea of what you can expect on your trip. FlightAware’s ability to identify inbound flights and their delays, combined with push alerts, and gate information makes it invaluable. It’s available for both Android and iOS, and making an account is free. While it won’t tell you if the crew for your flight will get there, you can keep an eye on the plane! 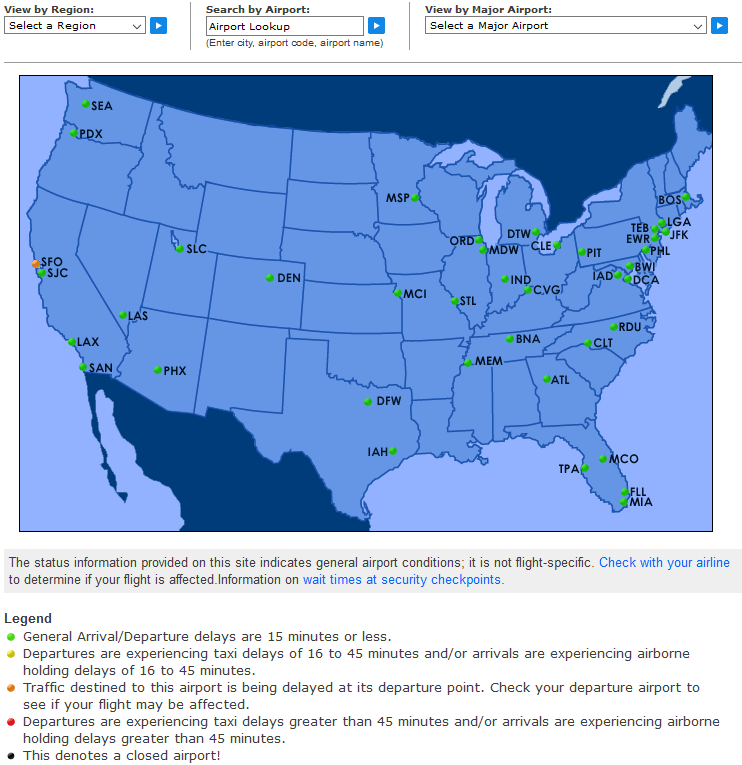 Next up is the FAA’s Flight Delay Information website. By default it shows the major airports in the US for various regions, but users are able to filter to a specific region or go right to the airport they are interested in, directly. Finally, we have the all-knowing Google. Google Flights is a wonderful tool for both planning and rebooking. Its interface has improved considerably over time and knowing what flight numbers you want to change to when you call your airline saves everyone a lot of time! One of my favorite features of Google Flights is shared with FlightAware: the display of historical on-time information, particularly when a certain flight is consistently delayed. When at all possible, fly direct! Every connection you add to your itinerary introduces the possibility of delays. This gets particularly tricky when you have multiple airports in the same region. It isn’t uncommon for flights to arrive at one airport (JFK) and leave from another (LGA). Be sure to pay attention to this when booking! The North-East tends to get hit consistently in the Winter, so I do my best to avoid flying through airports in that region if I can. Unfortunately, you can’t always avoid airports, so try to pick larger airports where you will have multiple flights to your destination. Another consideration when booking is what time of day the flight should be. While waking up at 4 AM for a 6 AM flight isn’t terribly appealing, earlier flights offer the most options with delays and cancellations. By taking an earlier flight, you have more time to find alternatives or reroute to reach your destination. It is in your best interest to keep on top of the weather along your entire route when traveling so that you can reroute if needed. Note that checking your bag will limit your options considerably. Many airlines will move the bag to your new route, but there is a very good chance of it being delayed if you take a different route. If you have to check your bag, be sure to keep a carry-on with a pair or two of extra clothes so you won’t be out of luck (and smelly) when you get to your destination! Time for the most important part… your flight attendants! These ladies and gentlemen are responsible for making sure you get from Point A to Point B safely, so treat them with the respect they deserve. Politeness and a smile goes a long way in making everyone’s day better. Don’t hesitate to bring treats for your flight attendants, especially when flying over the holidays. Keep in mind that these folks get paid a fraction of their wage when they are on the ground, so it is in their best interest to make sure you get in the air as fast as is safe to do. They don’t want to be late any more than you do, and every minute they spend on the ground impacts their paycheck in a huge way! How do you handle delays and cancellations? Have any tips you’d like to share?